I just finished reading this book that has been staring at me for a few years now since my dad gave it to me. It was a little difficult to get into just because I'm not an enthusiastic reader. Once I got about half way, I could relate to a lot of what Greg was writing about. This book is very similar to one I read earlier this year, They Smell Like Sheep, which I really enjoyed. 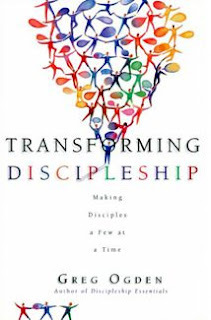 Transforming Discipleship is all about that, Discipleship. This is not a new concept to me although he claims to have invented it. Maybe I've heard or read something about him before?? Either way, it is something that I've always been passionate about. He talks about getting into small groups of 3 or 4 same gendered people and spend a year together studying, reading, praying, and challenging each other to grow as you keep one another accountable. This is a great concept and is similar to a couple of relationships I already have down here. The obvious purpose is for discipling the believers. The goal is that those other two or three people in your small group do the same thing the next year, but with different people. This, ideally, would create solid multiplying growth. We can sometimes get caught up in "such and such a number of people got saved." That's great, but I've always wondered who's discipling those who get saved?? I am very interested in integrating this as a "process" (he calls it) in our ministry. I want to try it out for a year. To start it, it will take $100 to buy two Transforming Discipleship books in Spanish and four Discipleship Essentials manuals in Spanish. Pastor Gollo and I are planning on starting this as soon as we can purchase them. I'm pretty optimistic about this since we already have a men's group that is integrated in the Church Ministry. It would be great if we could develop some more solid believers who are not ashamed of the Gospel. Cofradía would continue to be transformed into a different place. God is moving here and we're excited about it! "The tragedy is that most Christian leaders have placed almost no priority in transitional leadership." "Discipleship is an intentional relationship in which we walk alongside other disciples in order to encourage, equip, and challenge one another in love to grow toward maturity in Christ. This includes equipping the disciple to teach others as well." "Intimate, accountable relationship with other believers is the foundation for growing in discipleship." I recommend this book, not just to church leaders, but anyone who is interested in learning more about God and developing a more intimate relationship with Him. You can be part of this transformation by making a donation so we can purchase manuals. Click on this link and choose "AM Ministry Location" "Cofradia" and make a note for "Discipleship." Thanks for transforming the World. Hey Steve! I'm so glad you've finally been able to read this book. You might be familiar with his method because I read this a few years back and bought his discipleship study to do with Sandy, Mily, & Vero. It was a great read and it definitely helped to "transform" my thought processes about discipleship..what it looks like and the most effective methods. :) Enjoy! I remember you mentioning this. However, way before you mentioned this to me I had the book in my hands and the concept was already in my mind. You've done a great job with the girls. We just need to get this concept working with the people we use it with. The small groups we form need to be reproductive so that the gospel spreads. I have yet to see any of us model this concept completely and I'm excited for the opportunities we have to do it.